Spring is here! And so are the insects. You might be seeing fire ants and mosquitoes right about now, but wasps are also making an appearance. Now that the weather is warming, wasp populations will be on the rise. They’ll be building nests and hunting for water and food, so be on the lookout. Paper wasps are the most common in our area. 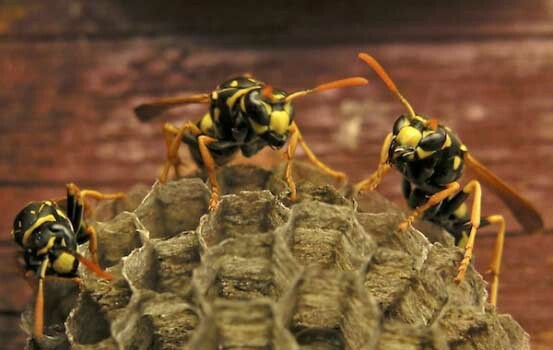 There are more than 20 different species of paper wasps that may nest in your landscape or around your home. They are actually very good pollinators and are considered beneficial in that regard because they feed on chewing caterpillars and larvae. However, they do deliver a painful sting and can be quite aggressive. If you find nests in a low traffic area, away from places children and family spend time, it’s often best to leave them be. However, if they become a nuisance around your backyard or patio, or entryways, it’s best to remove the nest. Call one of the local green-minded pest control companies around town to remove the nests if you have an infestation. Mud Daubers are another wasp commonly found in North Texas. Mud daubers don’t tend to sting as often as paper wasps, but stings are painful. The primary food for mud daubers are spiders…which can be a good or a bad thing. They tend to consume orb spiders, which are beneficial in the garden. But they are also the primary predator for black widows. Mud daubers build oval, round or tubular mud-type nests under porches and eaves of your home. Again, while they are not as aggressive as paper wasps, it’s still a good idea to call a professional if you have an infestation. Not all wasps are considered pests. There are also beneficial non-stinging parasitic wasps that can help control other pests in the landscape. As summer approaches, insects in the landscape will become more of an issue. Keeping a landscape healthy and in balance will always help to encourage more of the good insects in order to control the bad! Dirt daubers are definitely not a crew I would mess with myself. Even if they leave you alone more than paper wasps, they can be pretty aggressive if they feel threatened. Thanks so much for sharing!